We have come across Russian indie brand Fischer Audio before with their excellent value DBA-02 MK2 earphones so when the FA-002W was offered for review I jumped at the chance to see what these guys could come up with in the mid-tier level headphone category. I mean the wood cups are just really enticing if you are a woody fan and not just one wood selection but a whole bunch of tasty grains are on offer in a well put together if substantial padded nylon case. 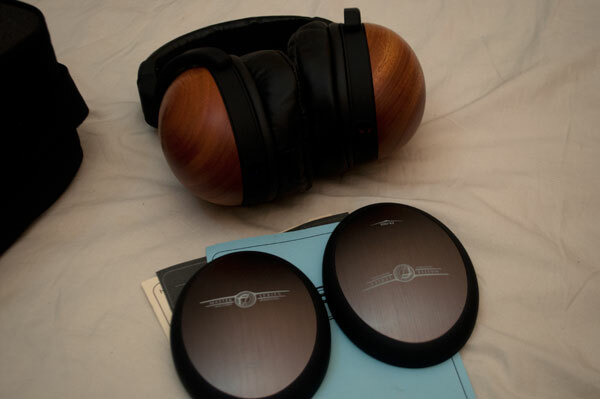 The design is not unique to Fischer Audio with similarities being shared with the Brainwavz HM5 headphone and of course the FA-003 with its more standard metal cups (note you can actually change the wood out for the metal cups) is really the FA-002 in design with the added wood. They do look unique and striking and to be honest you are not going to forget these in a hurry looks wise. 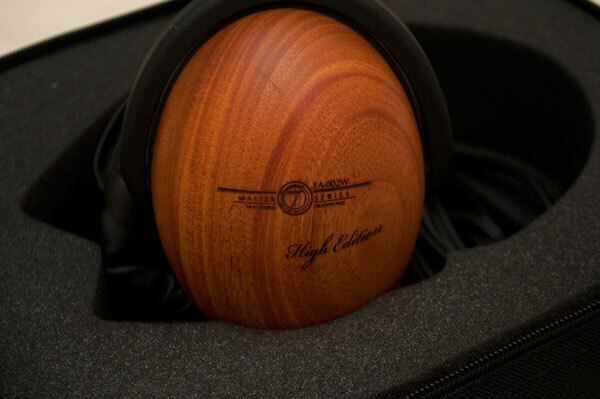 Sadly at the time of writing their website was down for redevelopment but what I can tell you from discussions with the team is that the FA-002w is part of their Master Series brand of headphones and they have a number of woody versions from Walnut, Ash, Mahogany, Wenge and plenty more though feedback suggest the sound signature stays much the same from version to version. The insides of the cups are stepped (5 in total) and its in these steps you get much of the core tonality. They retail in and around $300 to $400 depending on the wood in the cup being used and at that price your in with some stiff competition such as the Senns HD600 and HD650 and you are above the Amazon pricing for the AKG K701/2 series also. The FA-002W comes well packaged also with a nice cushioned soft nylon square zip bag much like the Beyer DT full size series bags and stuffed inside you get a spare set of velour pads, the detachable cables, the metal cups (in case you want to go FA-003) and some Russian/English pamphlets. There is a hint to late 40’s/50’s styling in the branding of the headphones but not as direct as their newer Jubilate line of headphones which we have a review of coming out shortly also. In all its a well thought out package that more than caters for what is undeniably beautiful looking headphone. 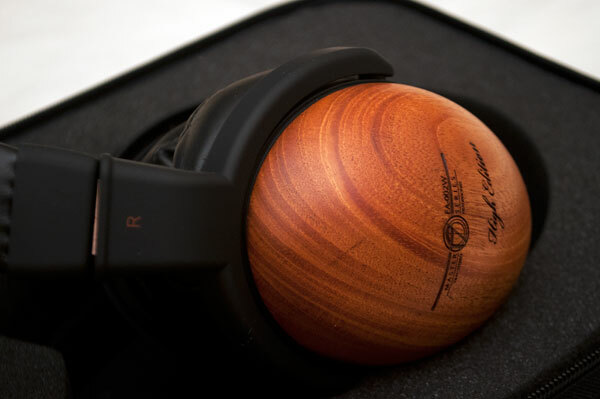 Comfort wise they are not the lightest given the large cup radius and the weight of the wood itself but they do sit pretty comfy on the head actually and being an over-ear there is not going to be any long term ear discomfort. You might want to wear in the pads just a touch so they soften up a bit for the extra bit of comfort. Out of the box they are still relatively stiff which press in against your head but nothing major. Being a closed headphone the seal is pretty good and isolation is above par once the music starts rocking. I didn’t go for the metal cups for this review instead staying with the wood for the burn in and beyond. The connectors are 3.5mm marked with red and blue and slot in pretty easy as a dual entry system housed at the bottom of the cups. I mentioned burn in and whilst there are some who believe and some who do not I have to tell you these need it out of the box and second to that think hard about the matching amp because they can be a tad picky also. Out of the box this is one big u-shaped tonal monster with a ton of bass (oh joy say some) and shrill hot treble (oh boo say others) with rather thin and recessed mids. Testing this initially out of the FiiO E09k I moved it to the Burson HA-160, a Little Dot 1+ and the Hifiman EF5 and my initial judgement remains from these tests – they perform better out of a tube amp period or a very warm signature solid state. They are pretty darn good out of the Burson also but the Burson has a warm signature with great bass impact so that didn’t seem surprising. I settled on the Hifiman EF5 even though its a tad too powerful at times as having the smoothest delivery but the Little Dot 1+ was not too bad either but just looses out slightly to the big boys. The EF5 had the edge on maximizing the sound stage and generally gave the FA-002W a thicker more lush mid-range. I even decided to go full CD with the Meridian 506 through a Beresford DAC just for the sheer hell of it rather than a pure digital approach – 20-bit analog sounds about right. No excuses for the FA-002W now eh? So back to pre-burn in tonality. If you like your bass thick with a big mid-bass hump and sparkling but hot treble then out of the box this is your headphone. After reading a few stories of more determined individuals give it a few more hours burn in time with some success I decided to go down the same route with some success but I must warn you this did not turn into some sort of HD600, the core tonality remains. This is a u-shaped headphone which works pretty darn well with dance, R&B, hip-hop and some more guttural rock and metal but mid’s guys this is the K550 anti-Christ so be warned. Moving them to the Hifiman EF5 amp gave some much need thickness back to the mid’s and this brings me back to amp matching – get a tube amp and they can sing, get the right genre and these can sing, get it wrong and they howl. I have to mention the atmospherics on the FA-002w are excellent with above average sound stage reproduction and great image accuracy. Throwing in the tubes helps substantially with vocal reproduction without loosing any impact from the dominant bass signature. I should note the sound stage though above average is not open can wide but rather conveys a more cavernous sound stage that is deep but a tad narrow. At the top end the initial hot edge and shrill reproduction dies down significantly with the Hifiman EF5 amp. Female vocals lose any harshness and sibilance and flow a lot more smoothly also and the mids come into the fore much better than on the FiiO and Little Dot. “Love is the Drug” by Carla Gugino and Oscar Issac (2011) is a great example of a nice accurate initial intro with the background bar room ambiance moving into an orchestral style Latino beat that is warm yet slightly thin and energetic. It excites and irritates in equal spades and octaves. When its on groove its a great little musical headphone with plenty going for it but throw in some fast cymbal crashing and fast paced guitar flowing and sometimes it can get a tad overexcited and go back to screeching. Another good example of this is Testament’s seminal 1992 offering ‘Electric Clown” which is just about one of my favorite Bay Area Thrash anthems ever. Low down this headphone is rocking, I mean really musical and captures that driving beat immaculately. Speed wise it can cope and detail is very accurate with a deep but narrow sound stage that copes admirably well. Moving through the mids and highs the detail is still there and the articulation is spot on but the heat starts to build up and the cymbal crashes can be very hot indeed. It’s not a harsh headphone by any stretch of the imagination, just that u-shape house wont be for all. Throw in Deadmau’s 2009 “Bot” and the u-shape matches just a treat with snappy but deep bass and fast responsive trebles. I think I found where this headphone is going to appeal. So who will love these and who will not? If you have a $300 in your back pocket and your a dance and bass heavy rock fan you are going to enjoy the FA-002W headphone – it’s musical, fun and beat centric in that respect with strong highs that paired with the right amp will give you a pretty darn good listening experience. If your into complex mid-centric music, indie rock, cymbal work and massive shredding this might not suit you so well. Cheap solid state amps might not do it justice also – go with tubes. If your going to buy a $300 headphone you may as well plug it into a decent amp also and the Hifiman EF5 does hit the spot pretty well. The Burson HA-160 a level up does an excellent job also with some added slam. I have heard mention of cable swapping but sadly at this time I can’t comment on that other than to suggest a bit of Denko on these might work wonders. I have to admit I am growing a bit partial to them after a week of solid listening to them on certain genres and they do look pretty darn good in wood over the more industrial FA-003 version. Try before you buy and see what you think yourself though – not everyone is going to have the right amp and this is going to be the big challenge. At $300 plus though this is not a casual purchase so I would expect those thinking of this have a decent headphone amp. Think carefully how you will match it and you will get a good return out of this, even more so if you give it about 50 hours plus burn in and throw into a nice tube setup. It’s in with the big guys at this price range but it’s a unique headphone, more striking then most and pretty well built. 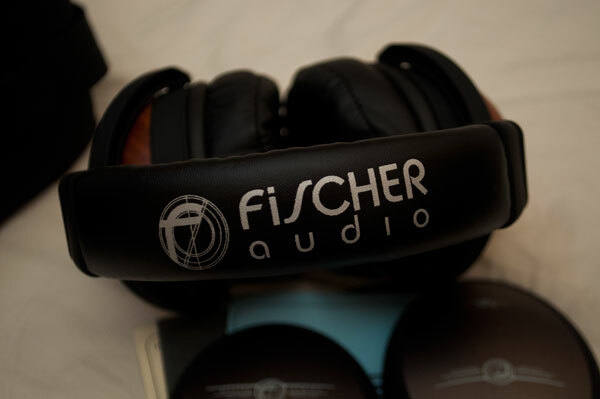 Interesting times for Fischer Audio I think. ← FA-004wh – For Those Treble Lovers on a Budget!